I talk about many subjects in detail in this blog – you can use the word cloud to navigate – but if you'd like a quick answer, this is the page for you. If your question hasn't been addressed here, please feel free to leave a comment on any blog entry, and I'll do my best to answer. Has the book been translated? I'm a blogger. How can I get review copies of your books? How many books are in the Bone Season series? Will there be a film adaptation? I'm an actor. Can I be in the film? If you were clairvoyant, what would you be? Have you written On the Merits of Unnaturalness? How do you plan your chapters? Have you planned out the whole series? Do you ever write to music? I have an idea for a novel, but I don't know how to start writing it. Any tips? I got the core idea from walking around the real-life Seven Dials when I was doing an internship there in 2011. There are shops there that sell crystal balls and tarot cards and the like, and I started wondering what it would be like if there were a society of clairvoyants living in a dystopian London. I rolled that together with a second idea I’d had about supernatural creatures being in charge of Oxford, where I was studying English Language and Literature at St Anne's College, and The Bone Season emerged from those two ideas colliding. The Song Rising will be out in March 2017. It's available for pre-order on Amazon here, and should be available from other retailers very soon. Aside from the Bone Season series, I'm also working on a high fantasy novel called The Priory of the Orange Tree, which will be published by Bloomsbury. Here's the official press release. Yes! Release dates and details on translations can be found here. I'm afraid this is completely out of my hands – the marketing team at Bloomsbury is in charge of distribution. You can request ARCs through NetGalley and Edelweiss if and when they become available. How many books will be in the Bone Season series? I don't currently have any information about casting for the film adaptation, and although I hope to be involved in it, I won't have sole control. If I'm made aware of any open auditions, I will update this page. Some of the books that inspired me to write The Bone Season were The Handmaid’s Tale by Margaret Atwood, A Clockwork Orange by Anthony Burgess, Nineteen Eighty-Four by George Orwell, The Day of the Triffids by John Wyndham, the poetry of John Donne and Emily Dickinson, and the works of the Brontë sisters. A bibliomancer, I think. There are various ways to practice bibliomancy (e.g. allowing a book to fall open at a random page and using the first words to identify something about the querent), but generally, it refers to connecting to the æther through books. Bibliomancers find true joy in reading and value books above all other objects. They also have one book – their numen – to which they become intimately connected. One of the worst things you could do to a bibliomancer would be to leave them without books for an extended period of time. (1) I have a published short story, Amrita, written for Vogue India in 2013. It's based on Hindu mythology and looks at the eternal conflict between the asuras and the devas in a fictionalised Jaipur. (3) I've contributed a story to an exciting new villain-themed YA anthology called Because You Love to Hate Me, edited by Ameriie, which will be published by Bloomsbury in July 2017. The anthology pairs Booktubers with authors, and it's going to be AMAZING. Read more about it here. I have, and you can buy it right now in eBook format! More information here. I did briefly offer a signing service, but this is now closed, as I just can't expect the staff at Bloomsbury to handle packing and shipping outside their other responsibilities. I'm considering negotiating with a bookshop to make sure they always have signed copies. I get up in the morning between 7am and 8am and make myself a big cup of coffee, check my emails and do social media or blogging, and start writing around noon. I tend to write slowly but solidly until quite late at night. I aim to sleep at around 11pm but often the writing urge will kick in when it turns dark, and I’ll end up writing past 1am. I usually write for at least seven or eight hours a day, if not more. I tend to have a rough idea of how long I want my chapters to be: somewhere between 14 and 25 pages in manuscript form (A4, double-spaced, 12pt), typically broken into two or three sections. If they’re over or under that, though, it isn’t the end of the world – what matters is stopping the chapter where it feels natural to stop. Transition is also important; you need the reader to want to read on, to be curious enough to turn the next page. It’s almost like writing a series of twenty-odd cliffhangers. Chapters can be any length and have any number of sections, though – as with all literature, there are no hard-and-fast rules. I didn’t plan out the whole series as soon as I got the idea for The Bone Season – I’m still having fresh ideas for the other novels now. It didn’t all come at once; it was all about layering, building up the world like an onion. All I knew that the story would be big, and that ideally, it would take up several novels. A few of the clues for other books were introduced during the editing process, as when I was writing the first draft, I wasn’t sure if a publisher would want to sign me on for a long series. I use what I call the “flesh-and-bones” planning structure, where I have the skeletal outline of the plot and all the important “joints” and twists (including the ending of the series), but I leave room for manoeuvre and for the characters to flesh the story out themselves. Often they just won’t do as they’re told, and I have to allow for that. Also, on a more general note, I think it takes the fun out of writing if you make yourself stick to a rigid planning structure. I like to know my destination, but not precisely how I’ll reach it. Most of my notes live in my head, although I do have a couple of notebooks in which I make mind maps, explore characters’ goals and motives and note down new plot ideas (which I usually have in the middle of the night). Sometimes it’s helpful to have something physical to look at so you can see how things link up. The length of time it takes me depends on all sorts of things. My first attempt at a novel (which went through numerous edits and "versions") took about three years altogether, primarily because I was still at secondary school and had to juggle writing with homework, classes and real life, but the first draft of The Bone Season only took six months, as I loved telling the story in Paige's voice and I managed my time much more efficiently. Not always – sometimes I find it too distracting – but I usually edit with music, especially instrumental music without lyrics or something soft and relaxing that doesn't encroach on my train of thought. Raised by Swans' No Ghostless Place is one of my absolute favourite albums. I also love listening to film soundtracks and trailer music: Two Steps from Hell, James Newton Howard, Ramin Djawadi, Trevor Morris, Hans Zimmer, Future World Music. Some writers start from the beginning of the story, some from the end, some from a random point in the middle. What matters is that they start somewhere. I think one of Jack London’s quotes is relevant here: “You can’t wait for inspiration. You have to go after it with a club.” This is just my personal opinion, but I think your best bet for starting a book – especially when you’re building an imaginary world – is often just to get a rough idea of the setting, drop a character into it, and start writing. Choose any point in the story and write something, anything. Whatever takes your fancy, whether it’s a pivotal scene or your protagonist eating breakfast. You’ve already done the really hard bit, which is finding good ideas. Don’t worry if you don’t know every tiny corner of the world or every last twist in the plot; you can always go back and edit your work. It’s like working up the courage to jump into a freezing cold pool: once you’re in the water, you’ll start swimming. I've written a blog post here about finding an agent, but the best resource I can offer is definitely The Writers' and Artists' Yearbook, which is updated every year with information on agents. You can also apply for bespoke mentoring, constructive advice and writing workshops on the site. When you write to an agent, keep the three Cs in mind: Calm, Courteous and Confident. Unfortunately, for legal reasons, I can't read any unpublished or self-published work. My agent and publisher won't pass it on to me, so please don't send it. You can get lots of helpful feedback from fellow writers and readers on sites like FictionPress and WattPad, but remember, literature is subjective – trust your gut instinct first. I'm represented by the good folks at David Godwin Associates (DGA), London. General enquiries should go to Philippa Sitters (philippa@davidgodwinassociates.co.uk). PR enquiries should be directed to Philippa Cotton (UK, philippa.cotton@bloomsbury.com), Sara Mercurio (US, sara.mercurio@bloomsbury.com) or Brendan Fredericks (Australia, brendan.fredericks@bloomsbury.com) at Bloomsbury Publishing. You can contact me directly via this blog, Tumblr or Twitter. My pleasure! I love blogging. Thank you for reading! I started reading your book "The Bone Season" few days ago and I am enjoying it. I can see you have an exceptional talent and an interesting style. Well done and keep it up. I wish to ask you for a favour. I am an scientist (PhD student, chemistry) and my reading used to be mostly academic. I do not have a regular reading habit before going to sleep or while on train etc.. I am trying to change that as I feel that my own writing (scientific again) is affected by my reading. I wish to ask you for some list of books (novels etc..) that I can start with which I can both enjoy and enrich my vocabulary. I am hoping that my planned reading style will also impact my writing positively. You maybe would be happy to know that I started with your book but when I went yesterday to the book shop for choose my next book I was overwhelmed with the huge varieties and could not decide on which book should be mine... please advice. I’m writing just having preordered of The Bone Season. Your book seems like it is one of the artistically driven YA novel out there treats its young readers as sophisticated and capable of enjoying a story with elements of strangeness. I’m so excited to dig into it! I’m also writing as a fellow author. My first completed novel is going out on submission this summer with my new agent. To cut to the chase: I’m wondering whether you’d be interested in giving it a look and, if you like it, sending some advance praise that we could use during submission, or after. I know the editors we will be sending it to would sit up and take notice if you had anything to say about the book. It’s a work of fantasy called The Remarkable Travels of Vaughn Nash. My hope is to offer a contemporary update of the classic stranger-in-a-strange-land story of earlier pulp and gothic adventures. If you’re interested, please drop me a line at projectraleigh@gmail.com. Thanks for preordering TBS! So glad you're looking forward to it. You're very kind, but I really don't think I'm the right person to ask about advance praise for a novel on submission – I'm not quite published yet! I'm not sure many editors would know who I was. You'd be much better off approaching someone who's already well-established in the industry. To be honest, though, I doubt you'll need advance praise if the story was strong enough to get you an agent. Your agent's enthusiasm should be enough. Best of luck with it; the story sounds great! I love Gothic fiction. I'm the owner of three Bone Season fan sites and was wondering if there was anyway to still get an advocate copy? I would love to write a review as my first post on my website. If there is any chance, please get in touch with me at andyflynnwebsites@yahoo.com. Thank you and can't wait till the release of the book on August 20th. Hi Andy – I've passed your request on to the team in charge of the advocate programme. Would love to see the sites! I do want to wish you great success and all the very best of luck with your writing career and The Bone Season novel. I was particularly impressed to learn that your book was picked up by at the London Book Fair by Bloomsbury Publishing according to a Wikipedia article. It is great how competitions and events for writers such as the London Book Fair help rising stars become success stories akin to author J.K. Rowling's from rags-to-riches inspirational journey. The triumphs of struggling writers, those are the real great stories if you ask me. As someone who is using a screenwriters guild competition to get a story originally a novel-turned-television show, I hope if you ever become rich and famous that you might consider emphasising in interviews the importance of such writing competitions and writing events/book fairs which help rising writing stars become huge successes such as yourself, Ms Rowling and many others in writing and screenwriting alike. Again, my best wishes for the future from wintry Australia. Thanks for your kind words. I do try and advertise writing competitions on Twitter if I see them – you're right, they do provide very valuable opportunities! Hi Steve – you should get in touch with David Foy at Bloomsbury UK, who handles stock signings. Is there any way to request a review copy of the Bone Season? I would love to review your book for my blog: Eveline's Books. We came across your work in, T - New York Style Magazine, your story of the Bone Season immediately struck me. We love the setup of world and character you've created. As a fellow fantasy writer, we'd love for you to check out our dark fantasy graphic novel page. www.facebook.com/AvalonTheWorldWithin (think Ghibli Studios meets early Ridley Scott, quite peculiar I know) if you ever get a spare moment between coffee-hazed dream-gazing. Look forward to being first in line for your debut in August. Your comrades in quills, The Brothers Harrow. P.S. If you don't want to check the page, please email us at harrowbrothers@gmail.com for friendly correspondence and other such frivolities. Cheers. I'm not a part of the blog tour, but could I request a Q&A anyway? I am very much like fiction, and as your Bone season is one of I will for sure read it, but still I could not get it. I am so happy that ypu become popular yet modest as if nothing has happened. your success encouraged me more to write my novel; fiction, 8 books. I now have got more trust and confident in me that mine will turn out just great. wish me so since I am now planning for a year and a half. I wish we meet oneday both successful now that you have made it is now the turn of mine to rival yours in the upcoming years. wish me best luck, as I wish you the same. My goodness! I am completely blown away at the moment. I am 21 years old, living in Florida, undergoing something of the same beauty as you (without having been published yet). I was sitting at my desk at work last May, I am a receptionist full-time, when the idea for my four part saga kinda of just...fell into my head. Tumbled, really. Within 5 minutes of that initial thought, I had a bunch of scrap paper spread messily around my desk as I tried to get my ideas out on paper. It's been over a year now and I am flying through the final revision before passing it on to possible agents. I must say, seeing such a bright, young, and hopeful individual following a very similar way of life and dream as me, is astounding. You have given me more hope than imaginable. You've made a true fan out of me, not even by your writing, but by your heart and character alone! Write on, fellow writer. I will follow you every step of the way and hopefully someday soon, create a path of my own :) Oh, and I am a Hufflepuff, read your blog on the Leaky Con! I just read a news story about you from CNN. What a wonderful story! And I love that you have a blog, as well! I really wish you all the best in your endeavors, and I plan on contributing by purchasing your first book. I'm not normally a fiction reader (nonfiction is my fix), but the style and topic of your stories seem to fit nicely with my interests (nonfiction-like appeal, plus sci-fi, spec. fic. appeal). I hope that I may join the ranks as you some day. Never give up your dreams! Even when all 7 books are written and the movies are made, always dream bigger! I am currently reading The Bone Season and I am about half way through. I have to say this is a fantastic novel and I am gutted (looking at your events page) that I missed you in Edinburgh literarly by a day or two! I hope you can come back to Scotland soon I'd love to have your signature on the front page of my book. I read a lot of fantasy novels (most of them involve Dragons of some kind) and it's rare for me to pick up a modern fantasy. But your book was recommended by a fantastic Youtuber named Carrie Fletcher so when I saw it on the shelves I had to pick it up. Right now your book is the perfect destraction from my busy world. So thank you for writing this because I have to say I am very much enjoying it. Congrats on the debut you deserve it and like I said make an apperance back in Scotland soon! Until then, good luck, keep writing and I am already itching for the second novel. I'm so glad you're enjoying TBS! Carrie was very kind to recommend it. Sorry to have missed you in Edinburgh – I would love to come back to Scotland at some point. I am raising money for a local charity for a little boy called Blu in Essex and we need to raise £50,000 for an operation for him and it is a registered charity and wondered if you would be willing to donate a signed copy of the Bone Season for us please? I can send all the charity details on to someone. Thank you. Hi Pebbles – I'd love to help, but I'm afraid I don't personally handle signed copies of the book – that's Bloomsbury's marketing department. You could try getting in touch with them? I have contacted them via e mail, thanks. If that does not work, would you be willing to have us send you a book for signing? I will drop a signed copy to Caitlin to send to you. Thank you that is so kind. I did get an emaill off of Caitlin yesterday. Caitlin e mailed me today and said as soon as you drop off the signed copy she will send on. So thank you. I'll be dropping it off to Caitlin on Friday. Just read you book...couldn't put it down!! Hi Phil – glad you enjoyed it, and I hope your group find it interesting. I spent the majority of last night, or more should I say the early morning, reading the bone season. I could not put the book down, it cast a spell on me. I no longer cared how tired I was my only thought that I keep reading (especially because of Warden and Paige!! So many feels!). This book is going to be big and it is going to be a pleasure to watch it become huge success. It deserves all the attention it get's if not more. All the best for the future! I am eagerly awaiting for the second book! Just wondering if there are any book signing's happening anytime soon in the London area or in the near future? I'm thrilled you enjoyed the book! I've asked Bloomsbury to set up a signing for me in London, as I live there and it's very easy for me to do one – I'll post about it soon. Best wishes for your future and can't wait for the next installment!! Of course not! Thanks for sharing it. I just finished The Bone Season and wanted to congratulate you on writing such an amazing book! When I saw on the Today show that someone my age- and a fellow English major- just published a book, I knew I had to read it. I really love your story because it not only has incredible fantastical elements, but also these characters who you immediately feel a connection with. I found myself constantly reading "just one more chapter" until I looked at the clock and realized I had used this excuse for a very long time and ended up reading 5 chapters...oops. I hope you will make it out to New York City for a book signing! Again, congratulations. You are awesome. Thank you so much! I'm so glad you enjoyed the book. I'll be in New York City for a signing and reading on September 12th at the 92nd Street Y (92nd and Lexington) at 7:30 pm. Hope you can make it! I just want to thank you for another amazing read with The Mime Order. I absolutely loved it and finished the book in 2 days! Have fun with your book tour! I am eager to read this once it available in Srilanka,though it not yet. I'm so glad you enjoyed the book. I'm hoping the second book will be out some time next year. I'm afraid I don't yet have any information about the film as it has yet to be funded or green-lit, but I'll update my blog as soon as there's any news. I just purchased a copy of your book here in the States. You probably get far too many requests, asking if you would sign a copy if it were sent to you with prepaid return postage, but are you planning any signings in the States. I am hoping you are and that it will be close enough for me to attend. My latest blog post has details about sending books to be signed. I am in NYC in September, so hoping I can do some stock signing while I'm there. Congratulations on an excellent first book in the series. Are there any plans for an Oxford-based public talk/signing? I'm doing a talk at the Saïd Business School for the Alumni Weekend 2013. I'll be in conversation with Dr Sam Thompson and James Benmore about writing contemporary fiction. It's 11:45AM to 1:00PM on Saturday 21 September. Hi Sam....first of all im laughing how many people are addressing you as Shannon and you havent got the heart to correct them(thats a testament to anyones character! )More importantly i've been wandering the garbage dumps of what passes for literature these days ever since finishing the last book of the Malazan book of the Fallen series and just bought your book online on the off chance and I have to say im absolutely LOVING it; congratulations im so glad you are planning a series. Im likely to finish it on my flight to London tomorrow night so can you perhaps try and speed up the publication of the second book so I have something to read on the way back to the USA? (or maybe e mail me a few chapters Ill let you know what I think.....)Mnay many thanks for putting pen to paper. Haha, I don't mind. I'm so glad you're enjoying TBS! I'll try my best to write Book 2 quickly. Hello from the States! Preferably New York :D Let me start off and say how much I have enjoyed The Bone Season and anxiously await the sequel (I have recommended this book to all of my friends, in hopes of talking to someone about this amazing book :) Your perseverance with publishing your novel has inspired me to continue with my stories and hope for the better for my somewhat writer career. All the best to you. P.S. Any chance you will be visiting New York for a book event? I'm so glad you enjoyed it! Lots of luck to you with your writing. Great! Hope to see you then. I've recently started running a blogging website about Literature, music and films, this event will definitely go on there. Hi Sam, I just read about you on the Sun website, welldone!!! I know you will be having many offers of stories etc but would love for you to consider one more. Like you this story has been with me many years, without me having the nerve to do anything about it. I have creative output, but not the ability to turn that into thousands of words and this is something that would suit your style. I do not want to write the story line on an open blog but would love for someone young and creative to take the story and run with it. A 200- 300 word abstract would cover the crux if ever you are interested. Thanks so much for commenting. I'm afraid I can't take on any other writing projects as I have many of my own to do, but I'm sure you'll be able to find a ghostwriter or similar that would be wiling to help you out. Congrats on your book. I have just finished writing a book myself and I would like to get it published but I have no idea where to start. Could you please give me some advice on how to get started. If you read through my blog from the beginning you'll find lots of advice on how I got started, how to get an agent and so on. You can use the "blogging about" links on the right sidebar to find specific topics. I've just submitted my work to Olympia Publishers and I'm hoping I hear back from them soon. Turns out that Olympia Publishers wasn't actually genuine. I'm upset about it but was hoping that you could give me the name of your publishing company so I could submit my work there. I've just started TBS and know that soon I won't be able to put it down. The map and charts at the beginning of the book are too small for me to read on my kindle. Is there somewhere I can find these and print them off in order to follow along as I read? Best wishes on your future - what a start! I'm 70, published my first book last September and have just finished the first draft of the second book. Better late than never. I hope you're enjoying it. The maps and charts can all be found here: www.boneseasonbooks.com/extras. Hope that's helpful! Hope all is good and you are enjoying your rise to fame :) Many congratulations on a first class book. Am really looking forward to the next instalment. Thanks for letting me know! And so glad you enjoyed the book. As I said on Twitter (@WRBolen), I'd love to interview you about The Bone Season for PostGradProblems.com (@PostGradProblem). Email me at Ross.Bolen@Gmail.com. Hi – could you email the questions to eleanor.weil@bloomsbury.com and say I asked you to send them? Thanks. I must admit the bone is really amazing. I thought after J.K.Rowling it is impossible for someone else to arrest me to read intentivly, but the bone pursuaded me to read it and acclaim it. very well written book, I look forward to reading the rest as I hope it will sonn be published.you are so modest as no matter what the folk talked about you being the next Rowling but you wanted to be Shanon which is your ethic. A question if you can answer, is the book an annual, I mean it will yearly be published? accually I wanted to write something as enjoyable and original as Potter, but I believe you took the advantage, and thankfully approved by all, I am planning my fantasy for about two years, I hope one day we will meet and remind you that it was me then commented on your blog. all the best and sorry for been too long. Hi Baban – I'm so glad you enjoyed the book! I hope it will be annual, yes. Best of luck with your writing. My name is Tal Rejwan and I'm the admin of the Israeli fan-page of 'The Bone Season'. First of all I must say that I really enjoyed reading your book and I can't wait for next one in the series! I was wondering if I could interview you for your fans in Israel (just a few questions. I assume that you are very right now). Glad you enjoyed the book! Could you please email the questions to eleanor.weil@bloomsbury.com (and say I asked you to send them)? Thanks! I've wanted to be an author ever since I was child and I at the age that I am now, I still do. I completed a trilogy last summer that I am super proud of. I didn't think that I would ever get a chance in the writer world and almost gave up searching for publishers and editors. I went into blogging but couldn't find a website that was suited for the things I blogged about. My mum found your site and said that you became published at a very young age. I was amazed and after hearing this story I was determined not to give up all hope and would try to follow in your footsteps. I am hoping to go to UNI soon and am struggling to decide what subjects I should choose or consider studying at UNI that will hopefully help me to become a published writer and hopefully a better writer. I was hoping that you could give me some advice and even suggest what you think would be best for someone like me. I hope that you will be to help in whatever you can. Thank You for inspiring me and for reading my message. Congratulations on writing a complete trilogy! That's a huge achievement in itself. I bought your book and finished it within the day - it was absolutely amazing! It was captivating, yet different and was thrilling to read. I just wanted to say you're very inspirational in all that you've achieved and that of all the books I have read, yours is most possibly one of the best. I can't wait to read the rest of the series! What can I say, other than it is by far one of the best books I have ever read. Let me list here who you are sharing that distinction with, since your book is even better than some of these: JK Rowling, JRR Tolkien, Kathryn Kurtz: her Deryni series of novels, Robert Jordan: Wheel of Time, Brandon Sanderson; Mistborn, Elantris, Warmonger, Stormlight Archives. These are just a few; I am very particular about the books I read. Thank you so much for a great novel, the only downside is now I have to wait for the next one. You've got me hooked. BTW Paige's employer Jaxon Hall. That's very kind of you to say – thank you. I'm so pleased you enjoyed it. I'm hoping the next one will be out next year! Hi Jessica – I'm so glad you enjoyed TBS! And thanks so much for sending me a picture of the display – it looks lovely. Looking forward to visiting Toronto soon. I read your Acknowledgements in The Bone Season. You mention that you "had no idea just how much passion and team work went into creating a book." I would be so, so, so grateful if you would please enlighten me on that. I am so desperate to find the answer to this that I even tried to tout for work experience just to find out how much "final" work goes into a writer's manuscript before it is finally made into a book. To what depth did you work with your publishing team to get the final product - The Bone Season . . . as is? This is very important to me because it will give me an idea of roughly when and where to let go. How much has your editors "gone miles beyond the call of duty"? as you say. This is so important to me. Finally, would you please reply this personally and not publish your answer. Your answer to my inquiry may prove to be all the work experience I need. As for writing, I spend roughly 12-14 hours a day . . . mostly feeling I am not getting far enough. Which is crazy given that people keep telling me I can really write. I'm writing a historical novel. Believe me, Samantha, you have no idea how much you will be helping me. I just pray you will reply this comment. Now to get down to reading your book. I will be buying all 7 and any others you write. Yes, you've guessed it. I am a writer. I'm happy to answer your question about editing, but I can't reply personally and not publish it, or you won't be able to see it! Let me know if you're happy for me to answer on here. You might also find it helpful to look through my blog, as I've written a great deal about editing over the past year. Just finished your book today, at work. Yes, at work. Ok, so it was the audio version. I couldn't "put it down". What a very wonderful and clever world you have created. I work for doctors, so I really enjoyed the medical aspect to the story. I am very, very much looking forward to the rest. I'm so glad you enjoyed it, Lisa! Glad you had a good time! Thanks for coming. I'm 22, a newbie writer who dreams, reads, watches and writes anything and everything that is SUPERNATURAL. I don't think that I chose this genre, rather this genre chose ME!! I got to learn about you and your book from the Telegraph article only recently where they called you the next "J.K.ROWLING". I'm dying to read your book and watch the film once it's completed!!! Like I said I'm a novice and my debut novel "HALF LIFE" is yet to come. Well currently, I'm writing a story (rather a series of 7 books) called IMMORTAL BLOODLINES that explores the origin of the supernatural species- WITCHES, VAMPIRES, and WEREWOLVES. I've got a blog on the same that I'd love if you could have a glance at it and tell me my follies and blunders as a writer or a story-teller. It'd be an honor and a great help indeed. I haven't received any formal English or Creative writing course though I plan to join one asap. Also, if you could name some good books, novels that could help me hone my supernatural writing skills, I'd be very obliged. Thanks and Congratulations for THE BONE SEASON. I'm afraid that alongside my own work, I just don't have the time to critique your work – it would probably be a better idea to hire an editor. I wish you the best of luck with your series and your blog. I just want to say that I love the book! I can't wait until the next instalment. I heard about it being turned into a film and I was wondering who you had in mind to play Paige? Personally I think it should be an (unknown?) Irish/ Northern Irish actress considering Paige is Irish and I think it would make it seem more realistic. The book is amazing once again and I can't wait to read the next six. Keep up the good work. Hi Claire – I don't have anyone in mind to play Paige at present, but I would definitely like her to be an Irish actress. So glad to hear that you enjoyed the book. 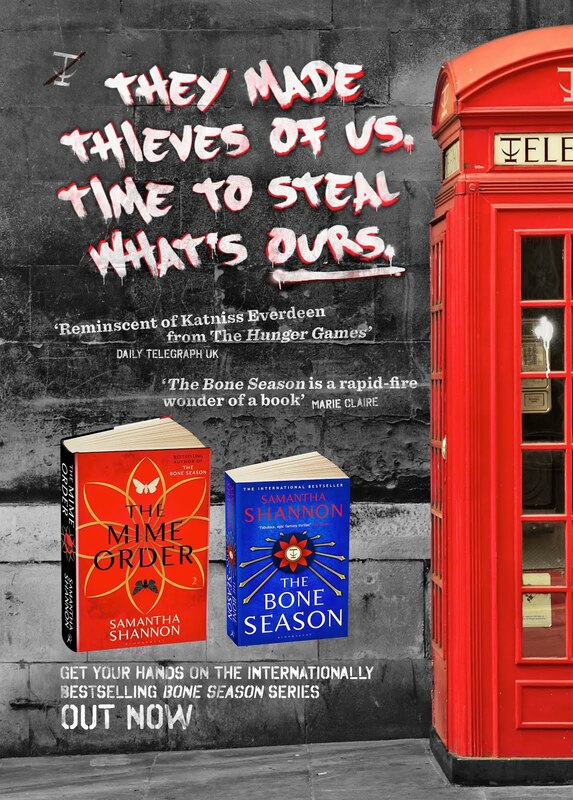 I did some work experience for Bloomsbury in July and one of my tasks was to read The Bone Season - I loved it! It was such an original idea, and I really found Paige to be a great heroine. If it's ever made into a film, it'd give others like The Hunger Games a run for its money! I was just wondering if by any chance you'd be interested in having a short interview with me somewhere in London? I'm a student reporter for the London College of Communication, and we've been asked to interview someone who's a high achiever in their field - the public response to The Bone Season has been amazing, and as a fan of the book myself I'd be really interested to ask you a few questions about how you got the idea, how you coped with student work at the same time etc. I actually studied English Literature at my university as well, so I know how much work you must've had to deal with at the same time as writing the book! If you're at all interested, could you please contact me via my email address? lucy_mercer@talk21.com - it would be a fantastic opportunity for me to speak to you in person! Hi Lucy – I've asked Eleanor at Bloomsbury to get in touch with you to arrange this. I have just started reading this book and it looks interesting. I apologise sincerely for making your eyes hurt, and I shall make sure that error is corrected in the paperback. Apologies, I accidentally hit "delete" instead of "approve" on your last message! I am aware of some typos and other small errors in the book, but unfortunately, there's not a great deal I can do about them now the hardback has gone to print. They are largely my fault, as I made some changes to the manuscript after the copy-editor had seen it. As I said in my last reply, I will aim to correct as many as possible in the paperback. Thank you for your concern. Would you want to see a list of anomalies I have found (perhaps it may save you some time when revising for the paperback)? I really don't mean or want to come across as pedantic, but, despite the misfire in my original post, I am a technical writer by trade and, having done enough editing, I know just how difficult it is to correct one's own work (we see what we expect to see). Hi Herbert – Sure, I don't see why not. Would be good to make sure I haven't missed any. Fire away. Throughout: Inconsistent use of "farther" and "further". I was taught "farther" for physical distance and "further" for most other usages, but this is by no means a hard rule. Throughout: Debatable and inconsistent use (and non-use) of commas. Throughout" Debatable use of emdashes. Page 109: "Flux was one of the only drugs...". Incorrect usage. Page 125: "Liss turned her away." Should be "Liss turned away." Page 156: "His dark eye itself fixed on my face." Should be "His dark eye fixed itself on my face." Page 157: "...opposite the Residence of Suzerain." Should be "...opposite the Residence of the Suzerain." Page 158: "...A large protion..." Should be "...A large portion...". Pages 158-159: On page 158 is "...pulled a roll of white paper...:. On page 159 is "...tapped his roll of blue." I assume page 159 should be "...tapped his roll of white." or similar. Page 159: "...takes her skin with it, too," Should be "...takes her skin with it, too." late, I don't remember offhand). something is either stuck fast or it isn't.). Page 366: "Suzette, one of my only friends,..." Incorrect usage. Page 386: "...with Michael and I at his side..." Should be "...with Michael and me at his side...". intend is "They will side with you against the Rephaim.:." Page 411: "...nector." Should be "...nectar." This is from the American edition, ISBN 978-1-62040-139-2. Thanks, that's very helpful! I had caught most of those but there were a few I missed. The copyeditor didn't bring up the commas or emdashes so I assumed they were all right. I remain puzzled by how several of them got in there. I know I didn't spell "nectar" with an "o"... We'll get them corrected for the paperback, anyway. Thank you. I think you should send Herbert your next manuscript. Pedantry is just what you want in a proofreader! It's a shame that even major publishers are so happy to cut corners in this process. Hi, I am a Canadian, reading the First US Edition. I am enjoying the book, and though I am not a technical writer, I noticed many of the issues identified by Herbert. I just finished the Bone Season. Just like, a quick question. Did Paige REALLY mean it when she said she would never see Warden ever again? Because this makes me really sad I'm actually not sure if I can continue reading the series if this is true. So, I just need to know. I mean, as an invested reader, I just take these things seriously. Hi Sarah – that would be a spoiler! I hope you'll continue reading the series, nonetheless. I just wanted to thank you for your piece of mind. I picked up your book at TJ Maxx. I honestly took a chance with it,I never heard of either the book or yourself. I haven't finished the book but it does hit a certain spot of mine which is dealing with consciousness. All in all I do hope to hear more of you and your work. I'd love to get to know you a bit more as to more of the motive behind your ideas for the series. Thanks again. I've written about my ideas and so on extensively in this blog, if you browse through it with the search bar. Also, if you click the "read more" tab at the top, there are links to articles and interviews with more information. Thanks for stopping by! Congratulations on a successful American and European tour. I followed your exploits with great interest. To cap it all you have now put together a fantastic giveaway of your visits. Those of that may not be lucky enough to get hold of one of these great prizes, is there any way we can get hold of the book in other languages.I have contacted may of the places in europe you did the book signing to get a standard book, but to no avail. Any thoughts would be great. Hi Kam – Is there any particular language(s) you wanted it in? Hi Dan – As I said to you on Twitter, I will keep it in mind. Hello! My name is Bryan Cohen and I'm an author of books on writing and creative inspiration. I'm putting together a blog tour and contest for my new book, "1,000 Creative Writing Prompts, Volume 2: More Ideas for Blogs, Scripts, Stories and More" and I was wondering if I could post a guest post on your blog. Would you mind emailing me at your convenience? authorbryancohen at gmail. Thanks in advance! That sounds great, but I'm afraid my blog isn't open for guest posts at present. Thank you for offering, though! And best of luck with the book. I'm sorry that happened – I was well on my way back to London at the time of the mass signing! I'm afraid Bloomsbury is no longer accepting books for my signature – the last round put them under a huge amount of pressure and took up an awful lot more of my time than I was expecting, as I had traders sending books filled with between six and ten copies. I'd be happy to send your friend signed bookplates, if that's at all helpful! I'm afraid I don't have any upcoming events for a while – I'm going to Australia next week and then I've taken time off to write Book 2. I may be doing an event in Waterstones Oxford at some point in December, but that isn't set in stone yet. The only other option I can see is you sending or bringing the books to my local Waterstones in Uxbridge, but you would have to arrange it with them (if they have the time) and get them to send me confirmation that they've received them. I'd be happy to stop by at the shop and sign them on my return from Australia if you do that. That sounds like an excellent plan - Waterstone's are a great store, hopefully they will agree. I will let you know - thanks! Hi Samantha, I am currently reading your book 'The Bone Season' and really enjoying it - congratulations on a real page-turner - I love what I'm reading. I first became aware of your book after I recently read an interview you did in which you explained that when they make the film adaptation of the book, you might want them to get in 'new blood' when it comes to several characters in the movie as you have very clear ideas of what they look like. From research and reading I believe that I could be what you need for the character of Warden. I am a professionally trained, experienced and hard working full-time working actor with a number of great credits to my name. I was wondering if you might like to take a look at my profile to see if I am appropriate. I am very pro-active in my career which is taking off at present so I am always looking for quality projects. Your time in reading my email is very much appreciated and I wish you every success with book 2. Thanks so much for getting in touch! I'm afraid we're nowhere near the casting stage for the film yet – we haven't even got the green light – but I will announce it on my blog if we decide to do open castings when the time comes. Glad you're enjoying the book. Hi Samantha. Thanks for the blog - a great insight into the publishing process. Sorry if you've answered this question before elsewhere, but how much detail did Bloomsbury need on the follow-up books before they committed to publishing the series? Just short summaries of each book, which have since changed extensively. They just want some idea of the scale. I'm a book blogger over at my little personal blog, A Bookalicious Story, and I'm such a HUGE fan of The Bone Season. :D I'm currently planning a celebration of sorts in mid-December to celebrate the end of my 2-year hiatus and the coming of Christmas where I'll be posting a line-up of some of my favorite authors as well as some new or up-and-coming authors every day. I was wondering if you'd like to join in the celebration? :) I'd love to have an interview with you! I'm so sorry, I completely missed this message! I'm afraid I've taken time off all interviews in December as I'm writing Book 2, but I'd be happy to do an interview on another occasion on your blog. If you could email the questions to boneseason@yahoo.co.uk I'll do them in January some time. I am a 16 year old student from New Delhi, India and have become a very recent fan of yours by reading your novel. I found it extremely thrilling with a very unique and interesting plotline. I am eagerly waiting for the sequel. I also heard that you will be visiting one of the schools in Delhi India around 13 th of January and in face my school has been invited to attend this session with you. If you are visiting Delhi then could you please provide me with the details. I'm glad you enjoyed the book! I am visiting Delhi, yes. I'll be doing a book signing at Landmark Bookstore in Ambience Mall at 6.30pm on 14th January, as well as the event at St Mary's School. My name is Shannon (seriously); and I can't tell you how much I've enjoyed your book. I finished it in about 3 days and I've turned around to go for a re-read. I need more!! When is the next one coming out? Hi Shannon! Great to hear you liked the book. I'm afraid I don't yet know for sure when the next one is coming out, but it should be this year. I've just finished reading The Bone Season and I thought it was absolutely brilliant. Don't hold this against me but I'm not much of a Harry Potter fan. Your book on the other hand I thought was amazing. The first person was so immersing and the settings are places I've been many times. So despite the alien-like creatures and alternative timeline, it all felt strangely real and easy to visualise; unlike any fantasy has ever felt to me before. One thing I was wondering is why you describe yourself as an Oneironaut on your twitter page? By this do you mean a lucid dreamer? And if so, could you elaborate more on your experience with lucid dreaming? Thanks again for the amazing story and I'm eagerly awaiting book 2. I have been writing a book for a few months now and have nearly finished it (a few chapters left) but I have had this other idea. I particularly like my first idea, but am really excited about my second. The problem I have with my second is that it is about vampires, though it is not at all like other vampire books i.e Twilight. I plan to finish my first book, but I am now reconsidering sending it out to agents and writing the book afterwards. What do you think? I'm not an agent myself, and I'm not in a position to advise you on what you should and shouldn't write – that's entirely up to you – but I suspect that agents get a lot of queries about vampires. If you do write the vampire book, your cover letter that states clearly how this differs from all other vampire books (which is a fairly bold claim to make, as there are so many of them out there). You need to grab their attention and make sure they don't switch off from the word "vampire". My name is Lorelei and I've absolutely loved your book. I think it was fabulously written and the story was incredible. Recently, my class was able to video chat with another author named Jeff Hirsch and it was an amazing experience! I was wondering if you were willing to do Skype calls with classes as well? I and many of my class would be very excited if you would! If you are interested, please email me back at lorelei.theve@gmail.com, thanks!! Hi Lorelei – I'm afraid I just don't have time to do this at the moment, as I'm working on the second book, but it's something I'll consider in the future. The main purpose of this blog is to give writers advice – if you browse through different topics, you might find what you're looking for, If not, please do feel free to ask specific questions in the comments and I'll address them in a post. we are your czech publisher and we would like to ask you for a short video greeting to our readers. Do you think it´s possible? Could you write me an email to my adress: plevova@hostbrno.cz, please? Of course, that's fine. Could you email Caitlin at DGA with the details? caitlin@davidgodwinassociates.co.uk. I hope you're well ! Hi Patrícia – I got it, yes. Will try to reply as soon as I can! I've been trying to get in contact via your agent to see if you would be available to read at a literature event I'm organising in Ickenham - I work for the London Borough of Hillingdon, and the event is a celebration of local literary talent, with readers from Brunel University's Creative Writing courses and local writers groups. I understand you grew up locally - we'd love to have a local girl head the line up! I did send a date which you couldn't do, but have since sent a couple of alternatives and haven't heard back despite a couple of chases - could you possibly get in touch and let us know? My email address is cbaldwin@hillingdon.gov.uk. Best wishes - and good luck with the next book! Hi – I'll ask Caitlin at DGA to forward your emails to me. Thank you so much, Henni – I'm so pleased you enjoyed it! I hope I can visit Germany one day. I can not wait for your next book!! I am Australian and saw an interview with you on a morning TV show in August. I am always looking for books in this genre which bring something new and fresh! I love the detailed world you created and can not wait for the next book. I'm even excited to reread The Bone Season as October gets closer! Hi Zita – I'm so glad you liked it! My name is Cris, I edit a pulp magazine in Spain (Ánima Barda). I would like to interview you because the publishing of your first book in my country. Would you mind to provide me a way of contact, like an email or similar, please? If you want, to mantain the privacy and not post it public you can give it to me via twitter. I´m following you, follow me and share it in a private message, for example. Mi user is @Cris_MiCa. Lots of thanks, congratulations for your novel :) I wait for your response. I loved your book, The Bone Season. I can't wait for The Mime Order to be released. I'm also a writer, working on a science fiction trilogy, and I'm an actress. I'm so excited for The Bone Season to make it to the big screen. I'd love the chance to audition for The Bone Season in a few years, once everything is rolling. I'd also appreciate any advice you might like to share with me in regards to writing, publishing and how it all works. in case you want to check out what I've been doing. I'm still studying acting right now. I finish my full-time acting course next year, and my BA in Communications will be finished in about a year and a half. If you're not too busy, I'd love to chat about all things writing. Unfortunately I just don't have time to give advice to people individually, but if you look through this blog you'll find a lot of information on how publishing works – I set it up primarily as a resource for aspiring authors. You can use the word cloud to look up specific topics. Best of luck with the rest of your BA! I wanted to know if you write poetry and if you do, do you plan to publish them? Who are your favourite poets if you have any? I write little bits of poetry, but I haven't published any. My favourite poet is Emily Dickinson. Hi Samantha & fans! Vote for a Bone Season movie + propose your dream cast! Hi, Samantha! How you're doing? Hi Vivi – sure, could you send the request to philippa@davidgodwinassociates.co.uk? Just so I have it in an email. Hello! Not one I give out publicly, sorry. I have my own blog, delveintodystopia.blogspot.co.uk, where I explore young adult dystopian novels and their authors. I am hoping to run a dystopian based writing competition for kids aged 11-16 based in the UK. I am including The Bone Season as one of the prizes, and would love to get a bit of personal input from you. Could you contact me via my blog? Hi Nicole – unfortunately I just don't have time to do videos for individual book clubs, but I'm so glad you enjoyed the book! I finished The Mime Order in two days (you can imagine how that may feel like after months I waited for it) and I absolutely loved it! I have so many questions but for now I just would like to know....when is the third book coming out?!? I can't wait to know what happens next! My name's Leigh and I am a reporter for My Ruislip News, I would love to speak to you further and get some information in the magazine about you're book, give you some free publicity and support a local author. Please contact me via email leigh@mynewsmag.co.uk or call 01442220190. Alternatively please give me your contact details and I would be happy to contact you. Had the pleasure of hearing you for the first time, with Joanna Trollope, on yesterday's "The World at One", BBC Radio 4. However, did not catch your name, and intrigued, I rang the Programme, and spoke to their Josh, who kindly (and instantly) enlightened me. Have since read Ms Kellaway's perceptive piece (on you) in The Grauniad. Which has led me to your blog, which I hope to dip into, as a Treat / Reward, after I have completed some of my many & various duties. Meanwhile, I dare to Hope that the Marketing People will leave you just as you are, or better still, were. Thank you for the lovely comments, Frank. The marketing people treat me very well, don't worry! I've just read the Bone Season and enjoyed it very much. I love that you take the time to give advice to young writers on your blog.I am a British university student and blogger and was wondering if you would be interested in doing an interview to appear on my blog, www.typewritered.com. I'd love to talk to you about what it's like to be a young writer, how difficult it was to juggle writing with university work and what you have learned through the whole process, as I think this would really inspire young writers, showing them that it can be done no matter what age you are. If you'd like to interview me, you can put in a request to my publicist at Bloomsbury, Madeline Feeny, at madeline.feeny@bloomsbury.com. I can't guarantee I'll be able to do it at the moment, though, as I'm in the middle of editing Book 3. First and foremost, thank you for your books! I've just finished reading The Mime Order, and I can't wait for the next to come. What I truly appreciate is how the worlds in your books are well thought out and detailed. They feel very real. I've only experienced such feeling when reading The Lord of the Ring series. There is something though that keeps me very unsatisfied. May be you plan to address this issue in the following books, or may be I get lucky to get the explanation from your reply? Here it is: Warden talking about his world said the Rephaim were not born, they just appeared somehow as fully developed adults. So why would Rephaim have male and female sexes, feel attraction, mate and get married? How do they know if they are Sargas or Mesarthim without having biological connections as families? And now as was formulating my questions, I started thinking about why would Rephaim have first and last names? And why would their names sound so human-like? My guess is they are not real but adapted to make communication with humans easier. What was your thinking? Thank you again for your wonderful work, please, keep writing! I am planning to address the issue of Rephaite sexes and mating, and why they group themselves into "families", in the books. As for their names: the names Rephaim use on Earth are not their true names. True Rephaite names are taken from Glossolalia, a spirit language that cannot be pronounced or learned by humans. The Rephaim took the names of stars in order to communicate on Earth, and they use last names so that humans can understand which family they identify with. How does the atmosphere or the room you write in look like and what can‘t be missed in there? If you would like to donate anything for the giveaway, which is planned for the end of the project, anything is welcomed and I will be pleased as well. Thank you in advance for your reply and wish you a nice day! I work in a small office with pink walls and bookshelves on either side of me. You can't miss my gramophone, which is designed like an antique but works with iPods and CDs. It's one of my most treasured possessions. I'm afraid I don't have much to donate for a giveaway, sorry! We are Cinemic, https://www.facebook.com/cinemic.pt , a video show, about film, comics and videogames, and we are producing a video series about the Comic Con Portugal Panels, for CCPT organization. We would like to know if it´s possible to do a short interview via skype, about your presence at Comic Con Portugal. Hello! Could you contact my publicist about this, please? madeleine.feeny@bloomsbury.com. It's just easier to organise by email. I hope you will find this music as enjoyable as I did.